Platinum Mixable Ink allows you to create your favorite color! Includes 9 colors that can combine to make beautiful hues, subtle shades and dark rich tones. Platinum Mixable Ink uses the power of chemistry and the potency of pure and balanced ph aniline dyes. Use a converter with the fountain pen and be sure to use Platinum Ink Cleaner set to wash nib. The Fountain Pen Ink Mixing Kit (included) contains one empty bottle so your mixed ink can be stored. Avoid direct sunlight and keep out of reach from children. 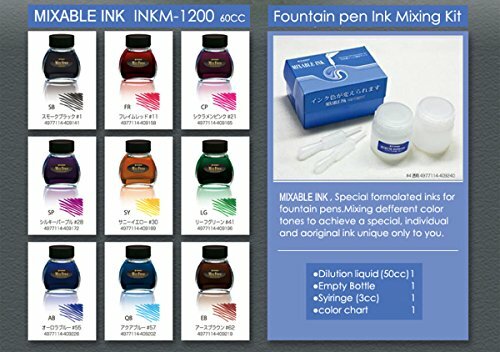 Mixable Ink Set Features: All Nine Mixable Ink Colors Fountain Pen Ink Mixing Kit Color chart Only use Mix Free ink with Mix Free ink. If you have any questions about this product by Platinum, contact us by completing and submitting the form below. If you are looking for a specif part number, please include it with your message.